The gym I belong to (Bally Total Fitness in Alexandria) usually has a pretty bare magazine rack with a few old Sports Illustrateds and some Muscle & Fitness / Men's Health. 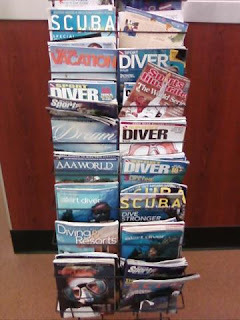 Today I noticed that the rack is not only full, but for some reason full with numerous scuba diving magazines. I'm not sure if Ballys has some diving promotion going on or not but this striked me as being a bit odd.